Our next destination was the Ol Pejeta Conservancy on the plains of Mount Kenya. 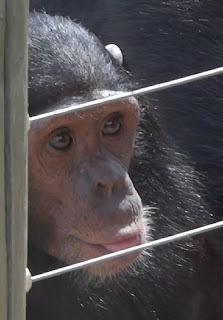 One of its highlights is the Sweetwaters Chimpanzee Sanctuary which provides lifelong refuge to common chimpanzees (around 40 currently) from West and Central Africa; orphaned and abused due to the ongoing destruction of rain forests and continued demand for bush-meat. In fact chimpanzee populations are decreasing and threatened with extinction. 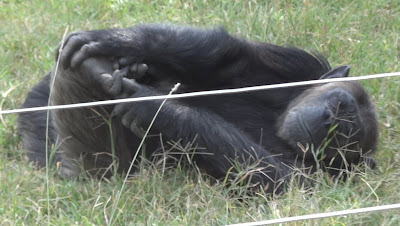 There are two species of chimpanzees residing on two sides of the Congo River: common chimpanzee in West and Central Africa and bonobo in the forests of the Democratic Republic of the Congo. They are members of the greater apes family, along with orangutans, gorillas and humans; the greater apes having split off from the lesser apes (gibbons and siamangs) 20 million years ago. The chimps were on the other side of an electric fence and all of them steered clear of the fence – they all knew, probably from a past incident, how unpleasant a touch could be. Though the chimp body is hairy, there is no hair on a chimpanzee’s face, hands, or feet. I can never forget the look of a baby chimp’s palm (for a youngster the palms along with face, ears and feet soles are flesh coloured) – how human-like does it look! They have four long fingers plus an opposable thumb (the thumb is shorter than the other fingers). Their feet have five toes, including an opposable big toe and hence they can grasp things with both their hands and feet. The opposable thumb also helps them to swing from branch to branch in the trees (there is a name for this - brachiating). They do have long arms - common chimp’s arms, when extended, are one and a half times as long as its torso and its arms are longer than its legs. Though I had not noticed it then, but later when I watched the video recordings, it is apparent that there is something odd about the way they walk on all fours – it is not hand walking but knuckle walking with clenched hands (it seems gorillas also do this, as do giant anteaters and platypuses; whereas orangutans fist walk)! This form of walking posture allows these tree climbers to use their hands for terrestrial locomotion while retaining long fingers for climbing. 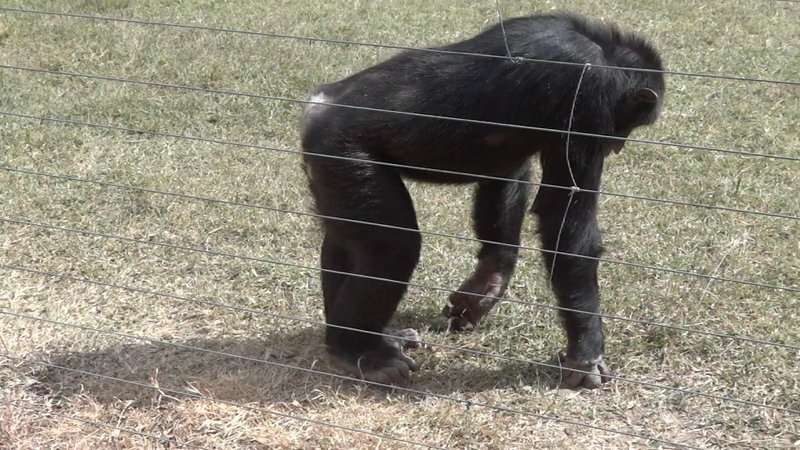 It also allows small objects to be carried in the fingers or toes while walking on all fours (we did see a demonstration of this when a chimp carried a stick with one of its legs while walking). Chimps can also stand and walk upright when carrying objects with their hands. The face with the receding forehead, flat nose and protruding jaws is capable of displaying a myriad of emotions, uncannily similar to us. Some of the tourists were throwing nuts at the chimps - I suspect there is a chimp gathering near the fence during tourist hours every day. Once when the flow of nuts stopped, the more aggressive members demanded for more by clearly signalling their intention through facial expressions and hand gestures. Far beyond simple gestures like clapping or thumping, scientists have found evidences for "chimpanzee spirituality" including display of mourning, "rain dance", appreciation of natural beauty such as a sunset over a lake, curiosity and respect towards wildlife (such as the python, which is neither a threat nor a food source to chimpanzees), altruism towards other species (such as feeding turtles) and even "animism" or "pretend play" like cradling and grooming rocks or sticks! Grooming was a common occupation among the group (after scratching of course) – but here again there are surprises. The thought of grooming used to conjure images of females grooming each other in my mind. In reality these social animals have a male-bonded society. Females do not develop strong social bonds (or groom) with each other like the males do. Males groom with each other to improve and strengthen friendships and calm members that are upset. Usually a male chimp stays in the community into which he was born, but females transfer to other communities when they become adults. All adult males are dominant over all females - now where have we seen this before? 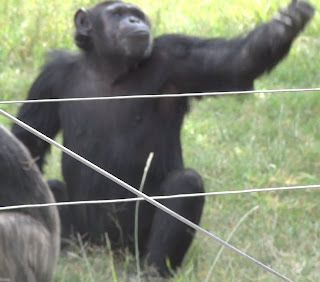 Adi's animals song goes "scratch scratch scratch like an ape"
Chimps have sophisticated hunting strategies requiring cooperation, they are status conscious, capable of deception, and they are capable of spontaneous planning for a future state or event. In chimp society, the 'dominant male' does not always have to be the largest or strongest male, but rather the most manipulative and political male which can influence the goings on within a group. Males typically attain dominance through cultivating allies who will provide support for that individual in case of future ambitions for power. Well we are the not the only ones who can play politics! A price that a species has to pay for intelligent brains is the rearing time for its young. 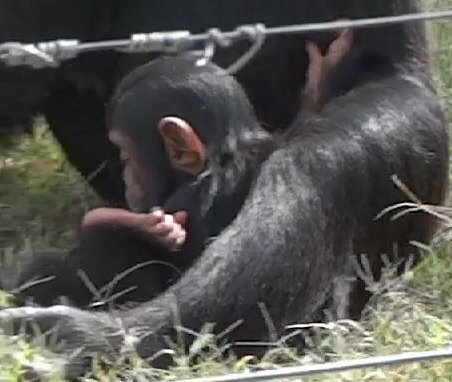 The newborn chimpanzee is helpless, with only a weak grasping reflex and needing support from the mother's hand during travel. Within a few days it clings to the mother's underside without assistance and begins riding on her back at 5-7 months. Young chimps get milk from their mothers until they are about three years old. They can begin walking on their own at about age four, but continue to stay with their mothers for a few more years (out of a total lifespan of approximately 45 years in the wild). 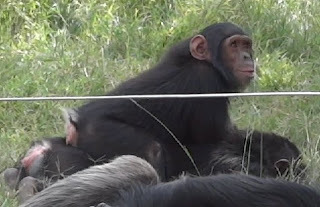 A mother chimp develops a close bond with her young that may last a lifetime. A recent study of wild chimpanzees found that both male and female adults can adopt orphaned young of their group! And if you thought only birds make nests think again – all great apes make nests (come to think of it, we are nest builders too). Chimps curl up (some were curling up on the ground in front of us) and sleep in "nests," that are bowl shaped leafy beds made fresh each night. Adults sleep alone and infants sleep with their mothers till they have to make way for the next sibling. 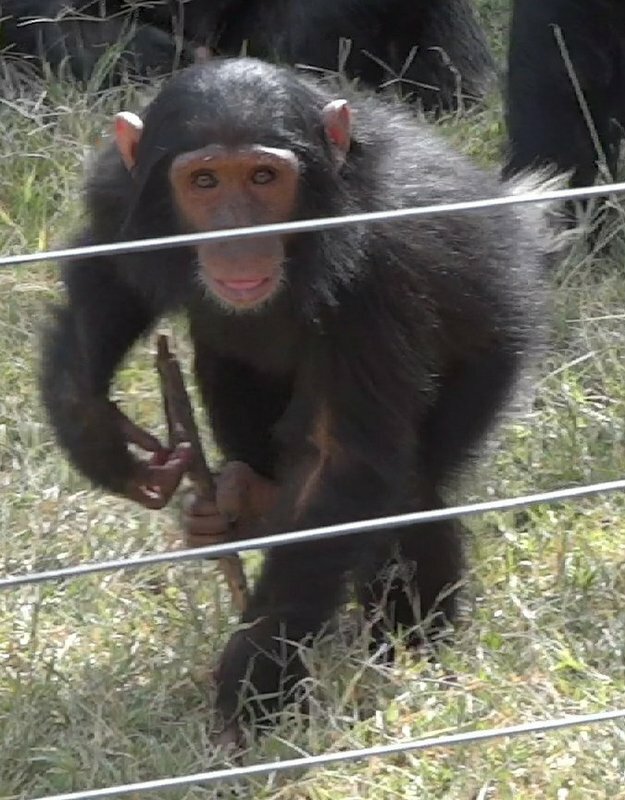 We have all heard and read about how chimps make tools and use them to acquire food or for social displays – for example use of large sticks or plant stems to probe into holes or mounds and then using an altered small stick to fish out the termites; use of sticks or rocks to break open fruits and seeds with shells too hard to bite open; use of leaves as sponges to soak up drinking water. Recent research indicates chimpanzee stone tool use dates to at least 4,300 years ago. A study has also revealed the use of advanced tools such as spears, which common chimpanzees in Senegal sharpen with their teeth and use to spear bushbabies out of small holes in trees! We got a live demonstration of tool usage right in front of us. Few nuts had fallen on our side of the electric fence. 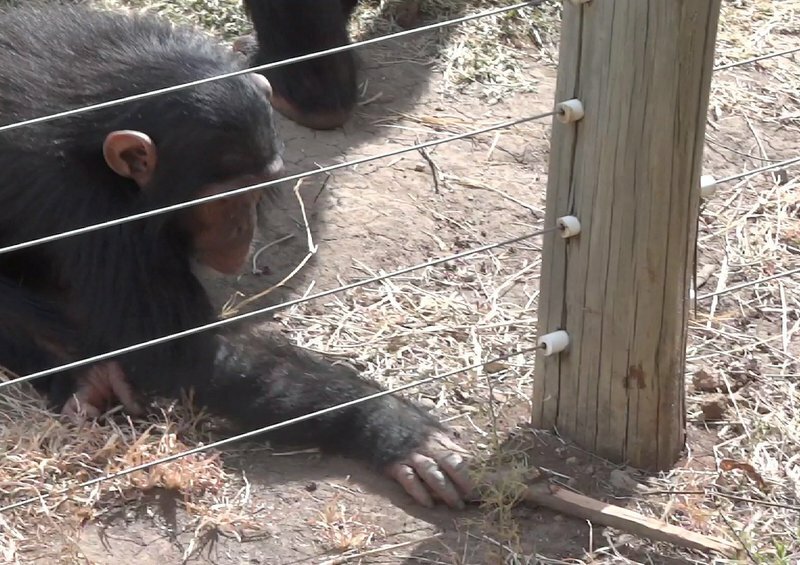 A baby chimp got a stick (thin tree branch), put it under the fence and retrieved the nuts to his side, careful all the while not to touch the fence! After that, another chimp who was watching the first one came up and picked up the stick, it must have thought that it was a very useful tool to have – that’s when we had the display of a chimp grasping a stick with its leg while walking. Watching these tail-less around 70 kg heavy creatures was unending fun equally for adults and child, perhaps because so much of their behaviour reminds us of ourselves – it was like putting a mirror to ourselves. If not for the black hairy fur, the playful kids in front of us could have been human babies. After all chimps are our closest living relatives, sharing a common ancestor (who lived some four to eight million years ago) and sharing more than 98 percent of our genetic blueprint. Hope the most intelligent ape can give its cousins their due share of the land.